Beam-to-column connections with post-tensioned (PT) elements are used in steel moment-resisting frames to provide adequate stiffness, strength, and ductility and to eliminate residual displacements under seismic loads. A steel PT connection has recently been developed with top and seat angles. In this connection, angles are used to dissipate energy under cyclic loading. This paper aims to investigate the influence of adding stiffeners to the top and seat angles on the cyclic responses of PT connections. 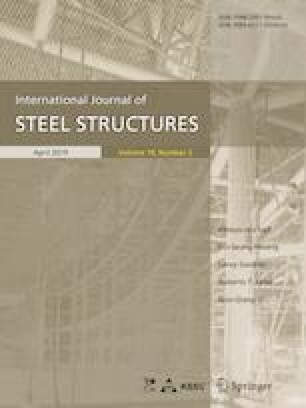 To this end, a parametric study is performed to compare the effectiveness of stiffeners and some design parameters in the cyclic behavior of the PT connections. The design parameters are the angle thickness, the distance between the bolt line passing through the column and the heel of the angle (g2), the PT force of the strands, and number of strands. First, the results of finite element analyses are compared to previously conducted experiments on PT connections with top and seat angles through a verification study. In this way, finite element models of 23 PT connections are developed and analyzed under cyclic loading. Results indicate that adding the stiffeners to the angles, enhances the energy dissipation capacity, moment capacity, stiffness and ductility of the PT connection much higher than improving other design parameters.